It’s not like someone would seek out this book looking to find advice on how to damage their marriage, but it definitely piques the curiosity of anyone trying to understand how easily a marriage can go awry. How to Get Divorced by 30 is Sascha Rothchild’s personal tale of her short-lived marriage. Surprisingly, it’s not a man-bashing book picking on her ex-husband (some of his faults are mentioned, but not focused upon). Instead, Sascha tells her story by explaining how the various events, influences, and personal insecurities in her own life led to her choosing a relationship that seemed to fill her needs, but resulted in feeding her flaws. Sascha’s unabashed honesty about herself, especially exposing her quirky personal demons, is highly admirable. Regardless of whether you agree with her viewpoints, you can’t help but revere her accurate self-assessment and the courage it took to write this book. You also can’t help but relate to her inner struggles with self-perception, including weight, looks, and identity. It’s normal for women to have insecurities in these areas, but Sascha takes the exploration further by discovering how her insecurities led to poor relationship choices. Looking to resolve her issues, she’d try to find a sense of security through relationships. We all tend to choose a partner who counteracts our shortcomings in some way or another, which is why you can’t help but relate to the author. However, what is most interesting about the book is how she focused on the fact that her unhealthy relationship with herself was not only the root cause of her divorce, but also the cause of her marriage (and other failed relationships) in the first place. By the end of the book you feel like you know Sascha personally. Her influence will cause you to stop and reflect on your own life, the relationships you’ve had, and how your own insecurities may have caused problems in ways you never before realized. I assure you this is a good thing. If we could all look at ourselves with blatant honesty (not harshness nor kindness, just what is) then we would all be better people. We spend too much time pretending to be what others think we should be, lying to ourselves, and trying so hard to measure up that we lose sight of our own needs and happiness. That’s what happened to Sascha. 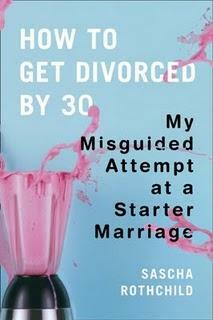 By sharing her journey of self-discovery (and divorce) Sascha helps readers to more truthfully look at their own lives. Meanwhile, the read is an excitingly entertaining journey. Be prepared to finish the book in one sitting. It’s a fast read, but mostly because you can’t put it down until you've finished it. great review! i'm gonna check this book out!